As counterintuitive as it sounds, a fast-paced world requires doing less and being more. Just to maintain any sense of equilibrium and stability requires first acknowledging our current pace of change and unease. The demands on our mind’s “affective life” today are akin to demands on our physical life in the Agrarian or Industrial Ages. Our current level of mental complexity requires more than tweaking around the edges by adding more apps, coping better with new tools, or taking more or longer vacations. We are not seeking to become more efficient or effective with the quantity of output. Ours is an inquiry into contemplative domains and practices that enhance the quality of input, the quality of our moment-to-moment living-in-the-world. The quality of our attention is the quality of our life. Our efforts thus far – with digital apps, multitasking, and productivity – have focused more on “output” or quantity, costing us a quality of self, quality of life, and quality of work. To engage in more demands – quantitative, emotional and mental – requires an internal view to recognize and access a distinct inward ecology, as cultivated through Space, Stillness, and Silence. Quantitative demands – We find ourselves doing more tasks in less time. The saturation of a 24/7 world: media, newsfeeds, and work create overload, pressure, and a hurried, frazzled state at home and work. The issue involves a new relationship to time. SPACE: The issue here is not one of time management. Leveraging every moment of time must begin to give way to creating space. Begin by reviewing your calendar, and stop booking back to back meetings, calls or events. Ironically, the notion that time is money is costing you. 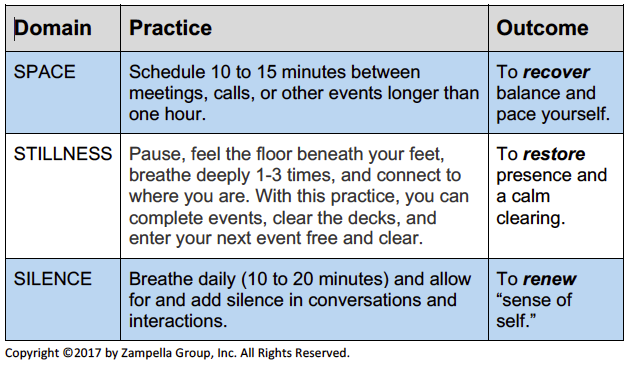 We can recover balance by placing 15 minutes between calls and meetings. Become a warrior for this space; it will enable you to pace yourself and manage your needs before entering the next event. A special kind of learning happens from reflecting on experiences and events to re-see issues, capture new thoughts, and allow for insights. Interestingly, even Google calendar now considers this space in-between invites. Its new “speedy meetings” reconstitutes a 60-minute meeting to end in 50 minutes with a 30-minute meeting ending in 25. Found in “settings” in Google Calendar. This design is not for me but may work for some. I prefer to include 15-minutes between any meetings or set of activities of more than an hour. In this space, I get up, walk around, or capture any thoughts I might now see. This small respite “decompresses” the event I just experienced. The practice of scheduling space during your day can seep into other areas of life: decluttering your desk, office, car, and briefcase. When we add space, we appreciate time to reflect to recoup, and notice the impact of clutter or compression. This prepares us to explore stillness. Emotional demands – our affective life, includes absorbing an exacting saturation of information: an avalanche of opinions, ideas, and attitudes from different perspectives and viewpoints can cascade without the time to decompress, or any recovery to reflect. Consider language informs affect as well. New terms, acronyms, symbols and concepts impact systems, processes, tasks, and applications with more updates, upgrades, and improvements – all of which have become part of what we are to deal with just to “prepare to work.” We take on more and more, just to keep up, and then it’s simply too much. The cycle of continually absorbing more without any scrutiny cultivates stressful frames of reference or perceptions that we then bring to other situations. STILLNESS: Leveraging the SPACE practice from above, will make it easier to find stillness. Greater content triggers anxiety and emotions that require a release. The everydayness of life is connected by larger events such as meetings, writing reports, traveling through traffic in a car, or getting on a packed subway. And smaller events such as responding to email, phone calls, quickly Googling items, or just reacting to news – all of these events trigger emotions and our “affective” life. We can restore presence and a calm clearing by creating mini pauses in-between daily events that will separate the river of emotions that flow from event to event and dam up at the end of the day. No wonder why we just want to cry or scream at the end of some days. Practice pausing in-between by becoming still for 10-15 seconds in-between events. Here’s how: pause, feeling the floor beneath your feet, breathe deeply 1 – 3 times, and connect to where you are – this will allow you to complete events, clear the decks, and find you leaving the last event in the past while entering your next event free and clear. 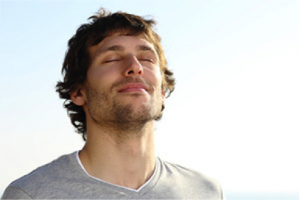 Using this pausing exercise regularly will expand your ability to be still and clear. As a practice throughout the day, adding stillness will eventually allow you to discover your deeper self to emerge in the form of new ideas, new insights, and even a new direction. You can now begin to appreciate silence. Mental demands – this is the degree to which you must exert sustained mental effort to complete tasks at home and at work. The fast pace and saturation of our distracting lives find it harder to remain focused on the matter at hand. Continual bells, “likes” from friends, dings, pop-ups, texts, pings, snap-chats, and notifications become a set of distractions to manage on top of any intended task. The effort to continually bring ourselves back to the present moment takes energy that can drain us. SILENCE offers us the possibility of venturing beyond the preoccupation or distraction with focus and into concentration. Viewing focus as the span of our attention, and concentration as the depth of our attention, we require more attention to enhance our focus. This seems counterintuitive to be sure. Only the quieting of the mind can access the depth beyond the surface rhythm of life that shapes our view. Our imagination, creativity, spiritual connection, and deep learning arises from insights tucked below the surface waves of life. Our last blog on Beginner’s Mind delved into this “creative process.” This link offers some benefits for our brain such as improving memory; stimulating brain growth; relieving stress; fighting insomnia; enhancing sensitivity. From silence emerges what is often ignored, unspoken or not yet sorted out. Adding silence in a conversation often finds others sorting through deeper thoughts beyond reflexive or automatic responses. 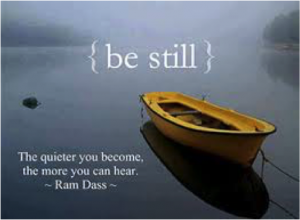 Managing the silence can be a struggle as it requires giving up control and yielding to the unpredictable. Most of us avoid silence in a conversation either because of another’s struggle, which makes us uncomfortable, or because our impatience requires a quick answer. Either way, we reject silence and rush in with an answer to rescue others. Teachers, leaders and managers can learn much here. If you want something new, offer others the silence to sort through their often concealed thoughts, and notice your own thoughts as well. These contemplative domains require a level of experience to discover how space recovers balance, stillness restores calm, and silence renews the frazzled, and fragmented sense of “self” to become whole again. 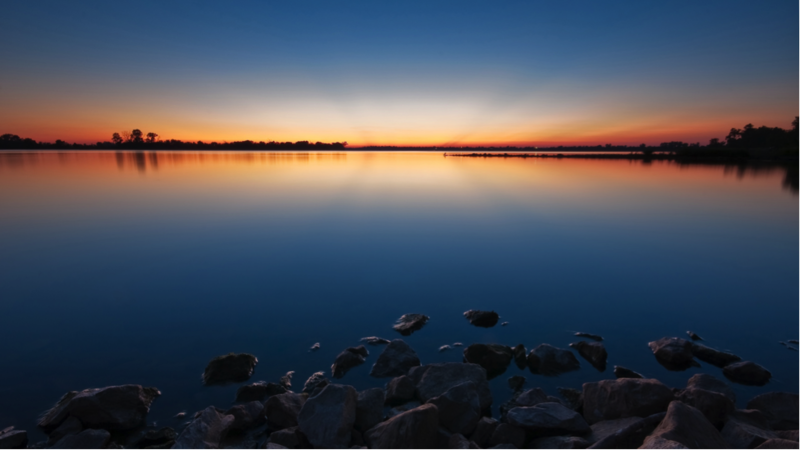 If we can appreciate space, stillness and silence we can cultivate and access these as “states of being” in our lives, deepen our listening, and bring these to others in our listening. Time crunches require space, saturation of information require stillness, and the mental drains require silence to recover, restore and renew our sense of self. Any of these will revitalize our quality of life. Remember, the quality of our attention lends to the quality of our lives.